The research focuses on the risky attitude Italian banks. In particular, the question investigated is either whether banks behave more similarly when they are analysed starting from their institutional classification (the so called de jure classification)—i.e., Commercial Banks, Banche Popolari or Credit Cooperative Banks; or whether other grouping rules which considered their actual business model (the so called de facto classifications) are more reliable. 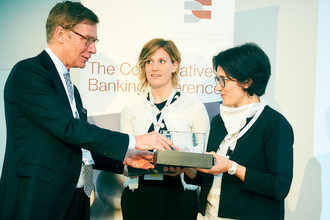 The analysis is performed through an econometric analysis, where different bank’s classification re tested: (i) institutional classification; (ii) the ownership division between cooperatives versus non-cooperatives; (iii) the de facto local versus non-local banks; (iv) the five biggest banking groups specification. The risky attitude of banks is measured with the Z-score indicators, while regressors are divided into two sets: bank’s specific variables and demand side variables. The hypothesis of a different behaviour related with different grouping of banks is partially verified. On the one hand, Banche popolari seems to be closer to commercial banks—i.e., for them, the level of insolvency is related with bank’s specific elements while the economic environment does not seem to play a role. On the other hand, local banks are more similar to CCBs—i.e., they take an important benefice (measured by the magnitude of the coefficient) from a higher presence of commercial banks’ branches, while the competition inside the same type of banks is not significant and they are dependent on the economic performance of the area. Thus, the classification based on the institutional features is not the only relevant one. More differences can be found when either the ownership classification or the de facto operating pattern is taken into account. Bank’s diversity is a great resource for the banking industries. It is important to preserve the peculiarities of each typology to enforce the entire industry. Ivana has a Master’s degree in Advanced Development Economics from the University of Firenze, and a PhD from CIFREM at the University of Trento, discussing a thesis on “The growth of Cooperative Credit Banks in Italy: ownership structure, management evolution and loan capacity”. She is currently research follow at the department of Economics and Management at the University of Trento where she lectures. Her research activity is focused on cooperative financial institution, with a particular focus on their governance issues and their relevance for the local development. In 2012 Erika graduated in Economics and Management. Afterward, in 2015, she held a Master’s degree in Finance from the Faculty of Economics of University of Trento (Italy) with a thesis entitled “The credit cooperative financial stability in times of crisis (2005-2013) – A comparative empirical analysis”. Erika is currently working in a local Credit Cooperative bank.